This is a retelling of Jane Austen’s Pride and Prejudice, but honestly, if that sounds intimidating to you, or too high-school-reading-assignment-ish, I will say that it is a fun, well-written book. I am a fan of Jane Austen, but I would suggest that if you have not read any of her books, that should not deter you from reading Eligible. (In fact, if the Box Office sales from Bridget Jones’ Diary are any indication, then most people already know the basic premise.) 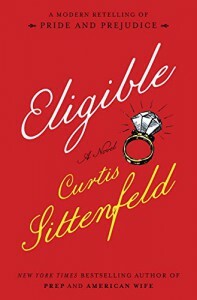 I am guessing the fact that Eligible in the title refers to a show not unlike The Bachelor will have a draw all its own anyway. The Bennet family is rife with unmarried women, and they are actually in need of more than one Darcy. They are an odd bunch, some mildly ambitious, others with no apparent ability or will to work; in fact, they were often more annoying than endearing. Astonishingly, this did not distract or disturb me, and, at times, I found myself rooting for even the most unlikely of scenarios. The parents are complicit, sheltering their daughters from reality as they have lived their own lives, until the whole of it comes crashing down, demanding immediate attention and sacrifices, much to the shock of their comfortable, lazy children. As men and women alike lose their sense of reason and fall victim to the vagaries of love, the world of the Bennets is remade, all because of a couple of eligible bachelors. The world of Eligible is truly an interesting place to visit… but, as they say, I wouldn’t want to live there.